Starting out in drone flying can sometimes be a daunting task. Drones come in a variety of sizes and with many cool feature. 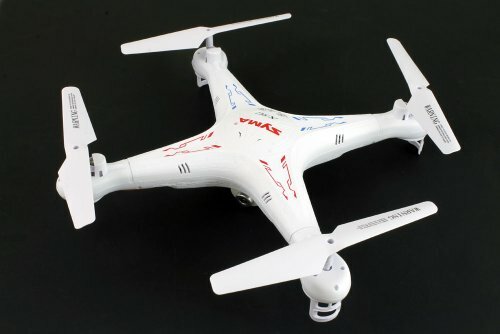 A total beginner will have a hard time picking out the right drone for them. 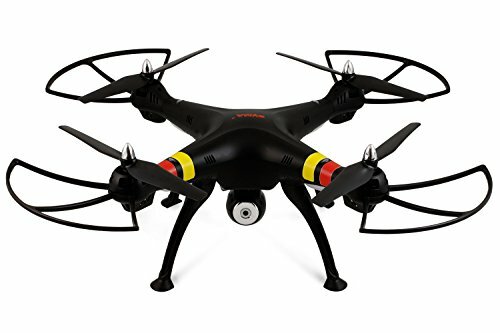 We have selected the best drones that are ideal for beginners. These drones are known for being easy to learn to fly. We have selected drones with different types of features and for all budgets. Syma RC introduces its latest X5C Quadcopter! A quadcopter is a machine that is lifted and propelled by four rotors. Unlike most helicopters, a quadcopter use symmetrically pitched blades mounted on four motors to produce lift. Controlling the speed of these individual motors allows the machine to move forward and backward, up and down, strafe left and right, and rotate clockwise and counterclockwise. The Syma X5C 4 Channel quadcopter brings a new element to radio control quads and offers a completely different experience of flying. It offers a refreshing change on how to hover, balance, and control a copter. With the help of an 6 axis gyro, stability and agility is achieved effortlessly. Flying the Syma quad is simple and intuitive allowing the pilot to enhance their skills quickly. Once you enhance your skills enough there are stabilization settings built in that you can disable to advance your ability to fly the X5C and perform 360 degree eversion. The X5C is also equipped with an HD camera to capture all your flying adventures. 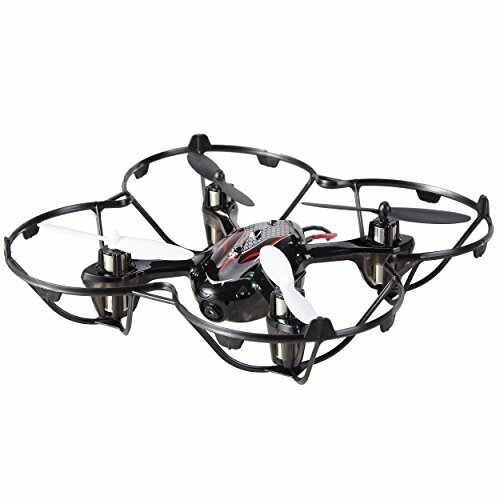 The UDI 818A offers new and experienced pilots both a 6 axis stabilized quadcopter that is capable of loops and high speed flight. 2 flight modes offer enhanced performance. Everything you need for alien missions is included in the box. Just add (4) AA batteries for the transmitter. Speaking of transmitters, the UDI U818A is controlled by a state of the art 2.4GHZ transmitter. You can switch between flight modes by pushing a button on the remote. When you get comfortable with how the quad handles and feels, pushing one button on the transmitter switches the quad to high performance mode for high speed flight. The protective body helps guard against crash and collision damage. One special feature about this U818A is the onboard camera. You can now film videos and take pictures via controls from the 2.4ghz transmitter. A push of a button allows you to take snapshots or record live footage, media is stored on a micro sd card (not included) up to 8gb. We’ve seen affordable quadcopters, and we’ve seen some really inexpensive ones. 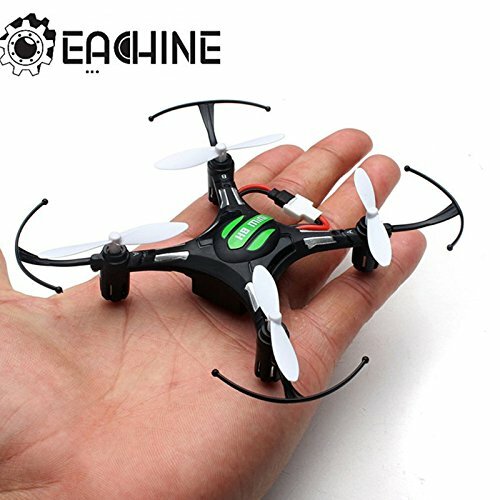 However, the all new Eachine H8 Mini probably beats them all with a price tag that’s lower than any other! The new Hubsan X4 LED edition features a whole host of new improvements to make this model the best micro quad on the market. 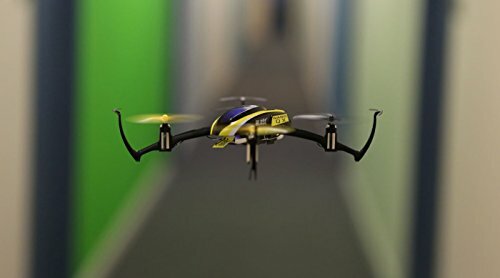 It may be small, but Hubsan’s X4 micro quadcopter’s performance capabilities belies it’s size with it even being able to fly outdoors, wind dependant. The X4 comes ready-to-fly with a 4-channel LCD display 2.4 gHz transmitter that features adjustable sensitivity modes for normal or expert flight. Charging for the 380 mAh LiPo battery is handled via a USB charge cable. The H107C version includes a front mounted camera with a video recording function. Just insert a Micro SDHC (not included) and experience birds-eye views from your Hubsan quadcopter. To balance the extra weight the H107C is fitted with larger more powerful motors. 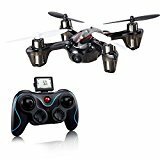 he Holy Stone 4 channel 2.4GHz Mini RC Drone is a lightweight hobby quadcopter perfect for everyone, from beginner to advanced. It’s powered by a rechargeable LiPO battery and comes equipped with a camera for taking both video and snapshots. It has four levels of control and works well both indoors and outdoors. 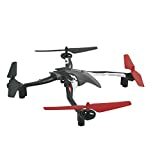 This drone is great for both beginners and seasoned hobbyists looking for a smaller, easy to use quad. The Dromida Ominus UAV Quadcopter is built for kids and novice flyers, get up and still keep flying! 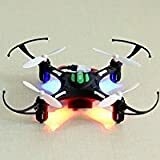 These make the perfect gift for kids if they’re interested in Radio Controlled multirotor drones and you don’t want to give them something that will just break. As you get better at flying, the Dromida Ominus also has four pre-programmed flight settings: easy, normal, advanced and expert. It also has Gyro stabilization and three accelerometers to make flying easy and fun! Most drones will require a bit of time tuning. The Dromida Ominus allows you to fly right out of the box with no adjustments needed in most situations. 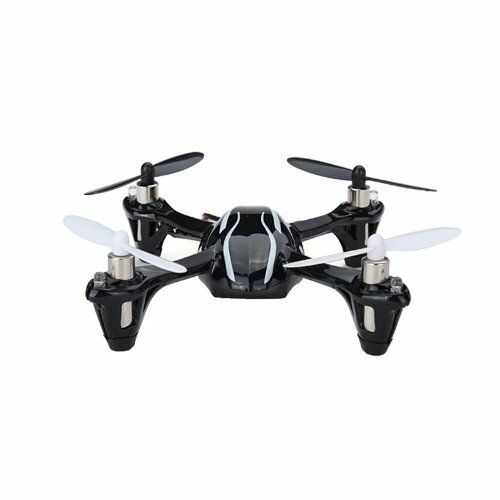 The Syma X8C is an intermediate to advanced quadcopter for users that are looking to make the first step into aerial filming/cinematography. The X8C provides a very stable platform with room for upgrades including gimbals and even attaching a GoPro. While initially the larger quad copters were the kings of the drone market, right now the trend has shifted its focus towards the smaller copters which are also quite affordable as well. The Syma X11 is a very small, yet highly affordable device that you can purchase right now on the market at a highly appealing price. Like it’s older sister the SYMA X11 – it’s very small.It weighs in at a petite 13.3 grams. The Syma X12 Nano is full of awesome features, and includes everything you need to get started flying it right out of the box. Below, we’re going to list and review the features and benefits of what comes in the X12 Nano box. 360 Degree Eversion: Being able to roll 360 degrees in the air is something to behold, and the X12 Nano comes with this operating ability. 6-Axis System: The six axis system is a real gem on the X12 Nano, and allows you to perform a variety of stunts in mid-air, including rolls and flips! Totally fun, but be warned that flips and rolls can take a lot out of the battery. It’s always best to do the flips when the battery is fully charged and fresh. 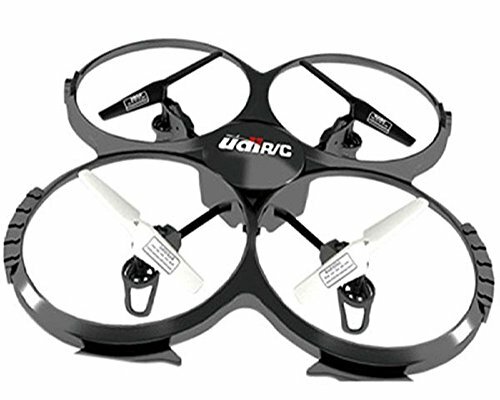 2.4GHz Radio Control: The 2.4 GHz spectrum allows you a generous flight distance, up to 20 meters indoors, and about 10-15 meters outside. There’s not very much room to fly, but you’ll get in less trouble losing track of it in such a small operating distance. The tiny Nano QX is RC flying fun you can take with you everywhere. The Nano QX weighs little more than half an ounce and is small enough to fly in spaces no bigger than an office cubicle. Never flown a quad-copter before? No problem. The Nano QX uses the SAFE technology system with sophisticated flight control software to keep itself stable in a hover while in stability mode. If you get in trouble, just let go of the sticks. The SAFE technology system will bring the Nano QX back to a hover all by itself. Once you’ve mastered the basics, you can switch the SAFE system to agility mode for faster flying speeds and more maneuverability. Home and roof inspections are now a major application for drones. The advancements in battery technology means drone flight times are longer than ever before….